Hermanns tortoises are a small to medium sized tortoise, rarely exceeding 25cm in length and upto around 2kg in weight, although there are as always the exceptions. Two sub-species are currently recognised, The Eastern Hermanns (Testudo hermanni boettgeri) and the Western Hermanns (Testudo hermanni hermanni). The latter being the smaller and more brightly coloured of the two. A distinguishing feature of this species is the horny tip on their tails, which is present in almost all individuals. In the wild they have a wide range through Europe including Greece, France, Italy, Bulgaria, Spain and the former Yugoslavia. When purchasing a Hermanns tortoise it is always wise to seek a UK breeder. 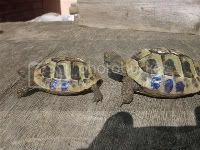 Many tortoises found in pet shops today are imported from Slovenia and bring with them a number of health problems. Always check your article 10 certificate, which should be supplied when you purchase your Hermanns. If the country of origin is Slovenia then it is advisable to have faecal samples checked for worms and other internal parasites by a vet. If done properly an indoor space for a Hermanns tortoise can easily be created. Hermanns do not do well when housed in vivarium type setups, where poor ventilation and humidity combined with constant high temperatures can contribute to a number of illnesses, the main one being RNS (Runny Nose Syndrome). The best housing, which allows good airflow is an open topped tortoise table. •A UV tube and a heat lamp. Although it at first seems cheaper to go with this option it can work out to be very expensive. Typically a UV tube will cost around £20 and a starter around £15. After 6 months the tubes will need to be replaced as the UV over this period will become depleted, hence making the tube useless. There is an advantage to this however in that the UV and heat are controlled separately and so one could be turned off without the other having to be switched on as well. •A combined UV/heat lamp. The initial expense with this option may seem a lot, but long term it will work out a lot cheaper. These bulbs last between two and three years and cost around £50. Compared to the life of the tube and replacement costs, then the combined will prove more beneficial. Whichever method of heating/lighting you use you should be aiming for 28-30C beneath the heat source during the day, with a cooler area away from the basking spot at around 20C. Hermanns do not require a humid setup unlike species such as Redfoots and so substrate should be chosen accordingly. Personally I use a combination of Play sand and topsoil (40% sand/60% soil) and aubiose (available from any good equestrian store). This combination works well for me. It is very important that a tortoises environment is stimulating and interesting for the tortoises. A water bowl is necessary, as despite popular belief tortoises do need more water than is provided in their food alone and will drink from a bowl. Things such as rocks, small logs and pebbles can all be added to make the enclosures more interesting. A good tip is to place items around the enclosure, which the tortoise is unable to see around. This encourages the tortoise to walk around the objects and explore the area keeping the tortoise occupied and gives them something to do. Hiding places are also a must to make the tortoises feel secure. All tortoises, from adults right down to hatchlings benefit from natural unfiltered sunlight. Outdoor areas for tortoises don't have to be anything special and don't need to cost a fortune to build. They can be built for use throughout the summer with a heated area for the tortoises to sleep in at night or they can just be areas where the tortoises can be taken during the day and brought in at night. Hermanns tortoises are fairly hardy. I successfully maintain my group outdoors from May to September 24/7 without any additional day or night time heat. Plants/Weeds are an essential part of a Hermanns enclosure. Not only do they provide natural cover, but they also offer the tortoise a chance to graze naturally. Some ideal plants to use in an outdoor enclosure are Lavender, Hostas, Hebes, Pansies and Petunias. Edible weeds can also be allowed to grow in the enclosure. Another great tip to creating a good enclosure is to add lots of sight barriers which will make the tortoise explore its enclosure more. A piece of border edging, a small rockery and even plants can all be used for this purpose. Another thing to consider is areas for the tortoise to hide. As already mentioned, plants are great for this but you can also build small hides using a flat rock placed over two small blocks, creating a gap in the middle for the tortoise to go in. You can also use terracotta pots half buried in the ground although many find that plants are the favourite hiding places of most tortoises. For a larger indoor area a greenhouse, cold frame or shed can be incorporated into an outdoor space. In the wild Hermanns tortoises have a highly varied diet in the wild and will consume numerous different species of different weeds and wild flowers. With a bit of forward planning a good, varied weed diet can quite easily be replicated in a captive situation. Some weeds and flowers which can be included in a Hermanns diet are: Dandelion, Bitter cress, Sow Thistle, Vetch, Clover, Dead nettle, Plantain Evening primrose, Hibiscus, Lavatera and Pansies. In the Hermanns natural range UVB levels are a lot higher than they are in the UK, for this reason it is advisable to add a D3 supplement such as Nutrabol daily to a Hermanns tortoises food. I also allow my Hermanns constant access to calcium in the form of limestone flour, either in a bowl in its powdered form or mixed with water to form a block. I also provide cuttlefish in my enclosures, although this is not as readily taken as limestone flour.